Add dazzling professional looking jpeg images to your video production in a blink of an eye! 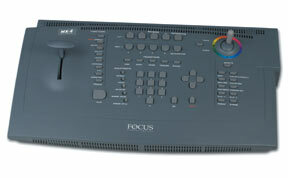 The MX-4 Digital Video Mixer is the next in a line of industry leading production performance devices by FOCUS Enhancements. It delivers high quality 10-bit 4:2:2 digital video on the fly with superior comb filter circuitry to provide crisp and clear images for your live event. Advanced features and an exceptional user friendly interface make MX-4 the ideal tool for both post production and live applications. We set the standard in video quality with the MXPro, offering great looking real-time 10-bit (4:2:2) digital video. Based off the MXPro, FOCUS Enhancements MX-4 is raising the bar with the addition of input comb filter circuitry providing superior digital and analog images without a loss in quality. With enhanced synchronized audio mixing capabilities MX-4 provides on-screen slider adjustment controls for volume and level meters. These enhancements, together with dual-field time base correction and a frame synchronizer will allow seamless switching between eight (four S-Video, four composite) video sources for the ultimate in source flexibility. Forget about limitations. With the MX-4 you have the resources to choose from over 700 special effects. Produce a world class professional production at the drop of a hat with transitions that include curved and jagged edges, trailing effects, organic shapes, soft edges, alpha wipes, color borders and drop shadows. Everything you need to mix a professional quality video is here with the MX-4. With all these new features FOCUS Enhancements MX-4 has set the standard as the new price/performance benchmark for professional digital video mixers. When you compare features, performance, and price of MXPro, there's no doubt. we have harnessed the latest digital video, integrated circuit, and microprocessor technologies to create a complete production tool with unprecedented benefits.The MXPro Professional Digital Video Mixer is the best value for today and tomorrow. Call us at 61-3-96998844 to buy. Or a dealer in your area.